Why only celebrate Valentine’s for one day? Instead, pamper your loved one for an entire month. Our Love Aromatherapy oil will get the passion flowing and bring you and your loved one closer together. *To upgrade to Deep Tissue (50min) add $10/ (80min) $15 to each massage. Melt your sweetheart’s heart with a 50/80 minute relaxing hot stone massage with Loving Aromatherapy included. Indulge yourself in the sweet aroma while you are massaged, exfoliated with salt scrub and hydrated with loving oil from head to toe! Make time for our ultimate 80 minutes of age-defying luxury retreat. High frequency, deep exfoliation, and vigorous serums address all signs of aging while creating a youthful glow that lasts. Take a break and unwind with our most desirable pedicure yet! Treat yourself to a scrub, silky smooth mask, Loving Aromatherapy foot soak and invigorating massage, creating the ultimate foot oasis. *Our relaxation room is available pre and post treatments to rest and relax. Water, chocolates, and snacks are complimentary. Wine and champagne may be brought in. 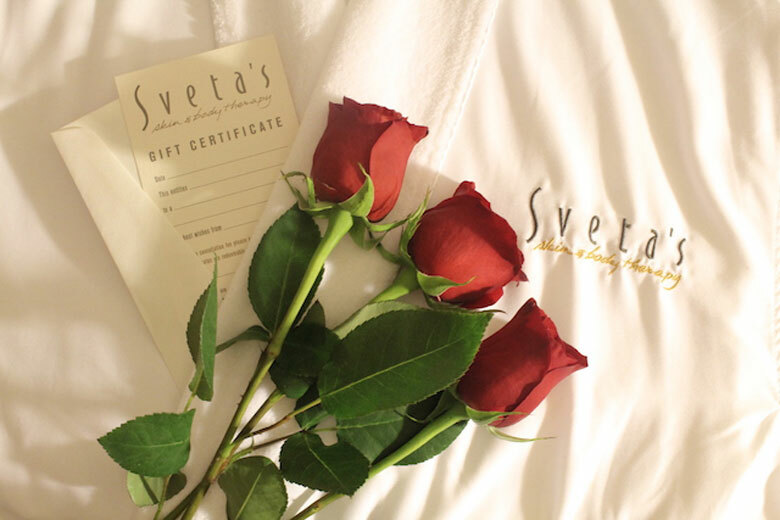 All services can be booked online at Svetas.com, excluding the Couples Luxury Indulgence.